If you use banding on the edges of your plywood parts, CutList Plus fx has the abilty to calculate the requirements automatically. It will even show you which edges require banding on the cutting diagrams. 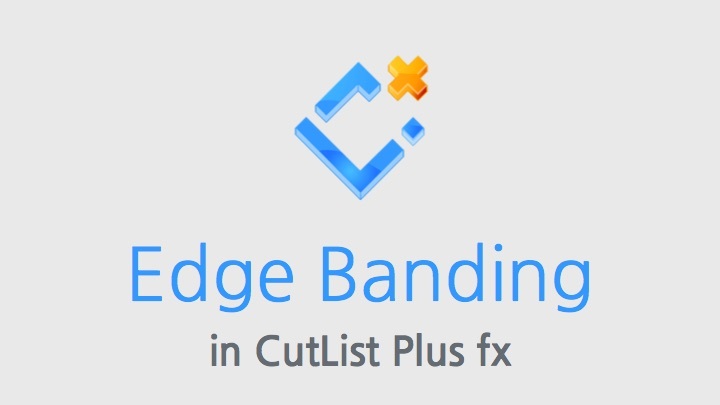 If you use banding that has a significant thickness to it, CutList Plus fx will make the appropriate adjustments when creating the layout diagrams. This video shows how to work with edge banding throughout the program. It includes setting up your raw materials, applying banding to parts, and viewing the banding reports and BOM. You'll also see how to customize the display of banding information on the parts list and on cutting diagrams. The banding feature is available in the Gold and Platinum Editions. If you would like to follow along with the video, here is a copy of the project file used to create the edge banding tutorial. Here, the edge-banding information panel is displayed with the list of parts. This allows you to specify which edges of each part require banding, and what banding material is needed for each edge. If you are using solid wood edging, you can have the program make the necessary adjustments to the dimensions of the parts, to account for the thickness of the edging.